All are Welcome to Attend! Bring your family, friends, neighbors, fellow Orthodox Christians, etc. Patricia Perry, is a professional historical interpreter, a member of the Association for Living History, and former Chairperson for Blackstone Valley Interpreter Network. She promises to bring to light the trials, triumphs and private details of our First Ladies from Eleanor Roosevelt to Michelle Obama. Flyers will be going out to the community. We are taking PAID RESERVATIONS ONLY, as we will be providing a luncheon. Please remit bottom portion of flyer with your payment to St. Spyridon Cathedral, 102 Russell Street, Worcester, MA 01609. 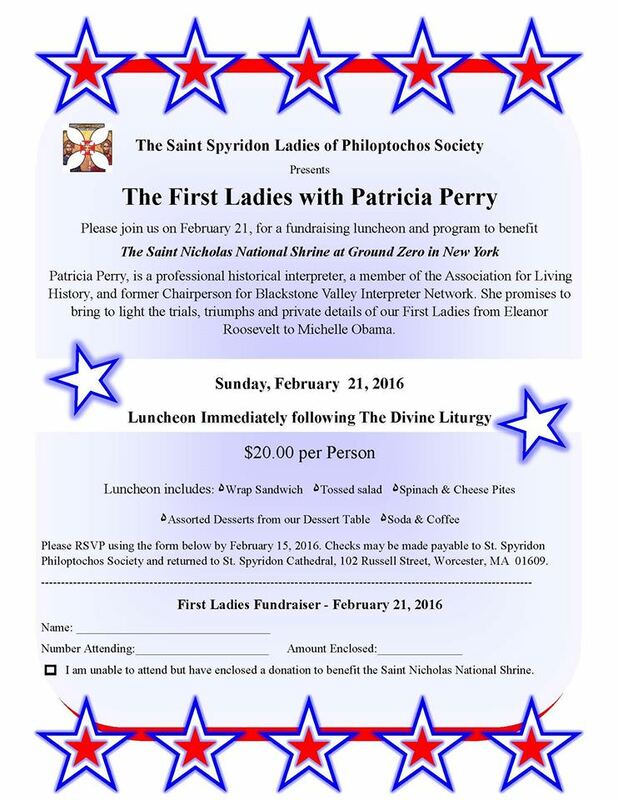 If you cannot attend, you can still make a donation which will be forwarded to the Saint Nicholas Shrine!